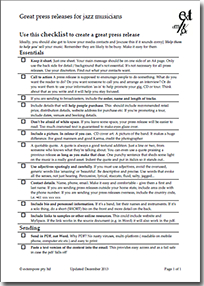 A handy checklist to help you get your press releases looking great. Includes tips on formatting, word choice, images, contact details and track information. If you’re a jazz /improvising musician and you need a great deal on a website, talk to us. We love building websites for musicians. We’ve been doing it for more than 10 years. Really. Just because you make music.